Jorrit is a HUTAC friend. He has been actively involved in the organisation since 2014 by supporting event management and promotions. He is now Event Manager of the organisation, aiming to boost the HUTAC community through inspiring and fun events. 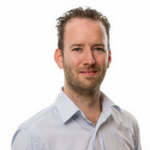 Jorrit works as Cloud Consultant at Capgemini where he focuses on infrastructure as a service. Prior to this role, he worked as Azure Specialist at ALSO where he was involved in pre-sales and supported clients’ migration from local services to the cloud. Jorrit has a background in both business administration and IT and has recently obtained the ‘MCSE: Cloud Platform and Infrastructure’ Microsoft certification that includes developing, architecting and implementing Microsoft Azure solutions. Jorrit likes experimenting with new ideas and is very action-focused. In his free time he loves being in the nature, travelling, riding his motorcycle, reading fantasy books and playing video games.